Longtime Albany architect Harris Sanders died this week at age 91. He designed a bunch of buildings around the area -- you've probably been in a few of them. 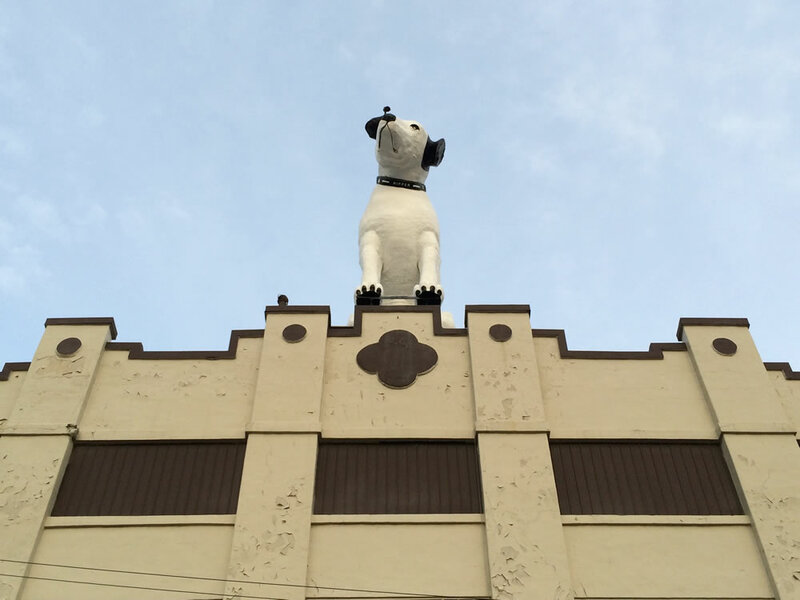 But his most notable local work is the landmark statue of Nipper that stands atop a building in the Warehouse District. That was his idea, a way of drawing attention to appliance distributor that occupied the building and carried RCA products during the 1950s. There were going to put it right next to the entrance door. That little four-foot dog they had would be lost on Broadway. They wouldn't even see it. So I said, if you want it visible, you gotta put it on the roof. So I figured 25 feet with a 12-foot base would be very visible. And it is. In a Sanders profile written by Joseph Dalton for the Times Union four years ago, the architect explained how he was inspired by the work of Frank Lloyd Wright, and you can see that influence in some of his buildings around this area. The Sanders architecture firm continues to this day. And his son, Daniel Sanders, frequently works on local projects.